In game development, the old adage very much applies: work hard, play hard. Last week, the Dogs threw an amazing wrap party at The BookBindery to celebrate the The Last of Us. Here are a handful of photos from the night. I took a quick break from my vacation to do press in São Paulo. 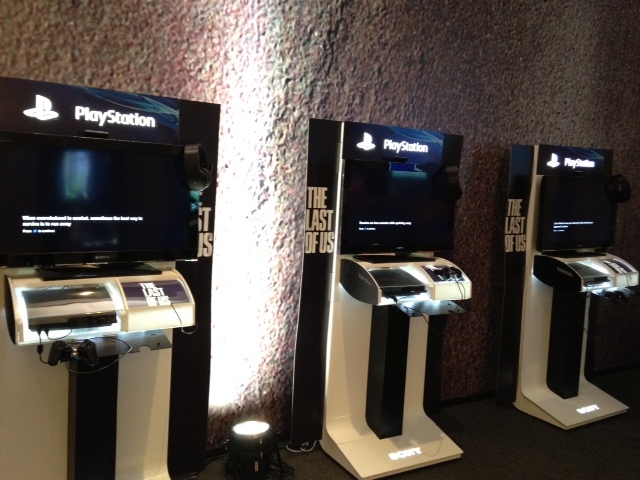 Sony Brasil had organized a sales event, and The Last of Us was to be the focus of the Playstation booth with several kiosks set up with demos of the game. Because I have family and friends in Brazil — a lot of whom are gamers — I was pretty eager to work at the event. It was also my first time doing press, so it was great having Jacob, our Lead Game Designer, at the event as well, since he’s had plenty of experience speaking with journalists. I could only track down one of the interviews that I took part in, but I’ll post more if I come across them. 11 white hairs, all of which sprouted up during production. 1 case of cervical arthritis. Oh, and my neck now curves in the opposite direction to how it’s supposed to be. Necks are not supposed to curve in this direction! 11 sessions of physical therapy to deal with the consequences of sitting hunched over my tablet for 14-16 hours per day. 5 lbs. gained by the end of the project (I gained 20 lbs. on Uncharted 3, so this is actually an improvement). 35 bottles of wine consumed throughout production. 6 additional bottles of wine consumed the night of art lock. This cute list is really only the tip of the iceberg. To be honest, this crunch was pretty brutal in a lot of ways, physically, emotionally, mentally, and I’m still in the process of recovering. All that matters to me right now is that, at the end of the day, all the personal sacrifice that I and everyone else put in to this game has paid off, and I got to be part of what I believe is going to be an amazing game. And I am officially on vacation.